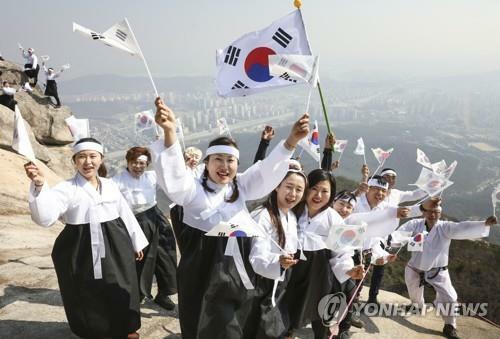 SEOUL, Feb. 28 (Yonhap) -- South Korea will commemorate the 100th anniversary of the March 1 Independence Movement on Friday, the nation's first and largest mass uprising against Japan's colonial rule in 1919. A variety of ceremonies, performances and re-enactments will mark the wave of protests that raged across the country for three months that year. President Moon Jae-in plans to lay out his new vision for peace and prosperity of the two Koreas. Government and civic groups will hold events to remind citizens of the independence fighters' sacrifices and commitment to self-determination and human rights. The uprising began with the Declaration of Independence, read by Korea's 33 national leaders at the Taehwagwan restaurant in downtown Seoul on the day. It declared "the independence of Korea and the liberty of the Korean people" and proclaimed the illegality of Japan's 1910 annexation of the country. Japan ruled the Korean Peninsula until 1945. After the announcement, thousands of people, led by students, marched through the Seoul streets, shouting "Daehan dongnip manse!" (Long live the independence of Korea!) The protests spread through the country and were ended by Japan's cruel crackdown in May. Korean historians estimate that more than 2 million people, or 10 percent of the population, participated in the protests for the three months. The National Institute of Korean History said it has so far verified data on 1,692 anti-Japanese demonstrations and 799,017 to 1,030,073 protesters nationwide during the period. Up to 934 protesters were killed, it estimates. The movement laid the foundation for the Korean Provisional Government, which was established in Shanghai, China, on April 11 of the same year and is credited with catalyzing efforts by other colonies to achieve liberation from imperialist powers. The centennial commemorations are likely to be held on a scale unseen before. Under the theme of "Let's Open Another 100 Years Together," the main ceremony slated for 11 a.m. at Seoul's Gwanghwamun Square is expected to draw about 10,000 participants, while a choir of 3,100 citizens will sing the national anthem and independence songs of 100 years ago at Seoul Square. 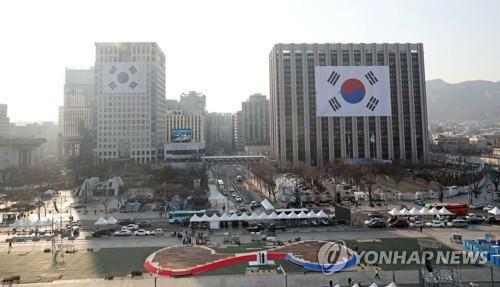 The Seoul metropolitan government will reenact the March 1 Independence Movement in a street march, art performances and other events on and near Seoul Square. The demonstration will be re-enacted in 212 areas nationwide from Friday to April 11. South Korea's seven largest religions will simultaneously ring a bell at all churches, cathedrals and Buddhist temples for three minutes beginning at noon on Friday and hold respective centennial ceremonies. "The March 1 Independence Movement was the ideological and political consequence of Korea's previous 100 years. It was also the watershed that formed the root of Korea's spirit and systems over the following 100 years," professor Park Myung-lim of Yonsei University said at a recent symposium. "Spatially, the movement was directly linked to a wave of democracy, republicanism, equality of sovereignty and peace movements that erupted after the First World War. In March 1919, all Korean people were united regardless of class or ideology. It's a half-truth to view the March 1 movement as a mere resistance against colonial Japan," Park added. The government attached a special significance to this year's event. On Tuesday, President Moon visited the grave of Kim Koo, who was the first head of the provisional government, in central Seoul and presided over a Cabinet meeting at the Kim Koo Museum & Library. "Young Korean students condemned the Japanese militarism and clamored for their country's independence for the sake of peace in the world, as well as in Asia," President Moon said in a social media message to mark the movement's centennial anniversary. The occasion comes amid a growing mood of detente on the Korean Peninsula and Seoul's deteriorating relations with Japan over historical issues. Moon is expected to issue a message Friday to reaffirm his commitment to peace and cooperation with North Korea, as well as the nation's relationship with Japan in his address at the government's centennial ceremony of the March 1 Independence Movement at Gwanghwamun Square. He has stressed the importance of South Korea's leadership in deciding the fate of the Korean Peninsula ahead of a landmark summit between North Korea and the United States in Vietnam this week. The president told Cabinet ministers that the elimination of pro-Japanese sentiments and honoring of the independence movement will be the first step to resurrecting the national spirit and creating a just country. 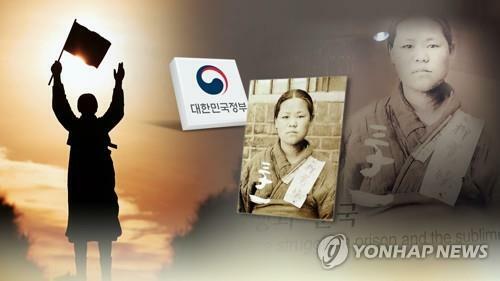 The Cabinet meeting approved a move to posthumously confer the country's highest medal of honor on Yu Gwan-sun, a renowned female independence fighter who played a leading role in the March 1 protests. The government said it is considering designating April 11, the founding day of the provisional government, as a temporary national holiday to commemorate its centennial anniversary. Prime Minister Lee Nak-yon recently proposed changing the status of the March 1 movement to a revolution, citing its significant historical meaning, while a number of scholars and half of 500 adults polled by a Seoul research company agreed with his view. The massive popular uprisings occurred due to an interaction of several factors, including an underlying resentment among Koreans over discrimination by Japanese colonial rulers and the formation of international conditions in favor of national independence, experts said. It is widely believed that the March 1 Independence Movement was also influenced by U.S. President Woodrow Wilson's principle of self-determination, as outlined in his 1918 address, as well as public suspicion over the mysterious death of Gojong, the last king of the Joseon Dynasty and the first emperor of Korea, in January 1919, and an anti-Japanese gathering of 600 Korean students in Tokyo on Feb. 8, 1919. Some historians say the movement was more aggressive and violent than previously realized, as seen in the cases of numerous arson attacks against and assassinations of Japanese police. The violent nature of the movement also influenced armed struggles in Russia and Manchuria, they note. "The March 1 movement was not a peaceful Manse demonstration centered on Seoul but a nationwide struggle for the right to survival by people from all walks of life. New materials have been unearthed to prove there were direct confrontations with imperial Japan," said Park Hwan, a history professor at the University of Suwon.